Cambodia’s third Senate election campaign was in full swing last week, with candidates fanning out to rural areas to drum up support among commune councilors, who will elect 62 senators on February 25. Normally, political campaigns like this would be an occasion for discussion and debate about the merits of different parties and policies. But this year, things are different. In the aftermath of the dissolution of Cambodia’s main opposition party by the Supreme Court in November, publicly supporting the opposition has become risky and, in some cases, illegal. It is not just ex-party officials who are fearful. Even low-level supporters and those who had no formal affiliation with the Cambodia National Rescue Party (CNRP) say they are scared to discuss politics and even meet with each other socially. “We don’t lie like the wind-and-smoke words of the contemptible Sam Rainsy and Kem Sokha,” Mr. Eysan declared. Nearby the campaign event, in Chantrey commune, villagers told VOA they were anxious about publicly discussing even the most persistent problems in their area, such as the lack of electricity or running water, and the unpaved road running through the commune that kicks up dirt night and day. Along that road, Neth Samun, 56, runs a small grocery store that is often coated in a layer of dust. She and her customers used to chat about social issues, particularly the loneliness and lack of social cohesion in their village since so many young people have migrated away to find work in factories near Phnom Penh. Several of her 11 children have followed suit, and she cares for one grandchild whose mother is a garment worker. “Before, we talked about garment factories, garment workers’ pay, and our nation’s issues, but now we don’t dare to talk,” she said. Alleged Vietnamese border encroachment has been a potent political issue for the CNRP in past years, but most of the opposition’s loudest voices on the issue are now in exile. Samath said she used to discuss Vietnam-Cambodia relations with other villagers and the local CNRP commune chief, Mey Dara. Now, he never even stops by her shop. “It is very silent. Before, he came here and we talked,” she said. “I don’t dare to talk,” she added. “I’m afraid of being mistreated. So I keep silent like the others. The situation is more intense for those who did have a formal affiliation with the opposition party. 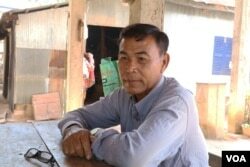 Dara, the former CNRP commune chief, explained that he was being watched so closely that he hardly left his house. “If there is a gathering of four or five people, they will come to watch us,” he said, looking at the dusty road in front of his house where small cars and big trucks are passing. 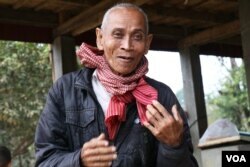 “I can’t communicate with villagers like before,” he added. “I am afraid that people will be accused of something,” he said. As he spoke, his wife got up from a nearby hammock and interrupted her husband. “Is it OK to talk?” she asked. She proposed moving inside the house so nobody could see the couple speaking with a journalist. Dara and Marong, who are longtime friends, rarely even communicate anymore. “Now we just meet when joining things like weddings and other religious ceremonies, and we just ask each other about other things, not about politics,” said Marong. He said former opposition members were being watched in case they “form a group,” although the Cambodian constitution guarantees the right to free assembly and association. “We follow and watch them,” he said. Chen Samean, 39, a farmer, agreed that she and other villagers who had been sympathetic to the opposition were wary of getting together. “When we are together talking about politics and someone comes along, we stop talking for a while. When they are gone, we continue talking,” said Samean, a widow with five children. 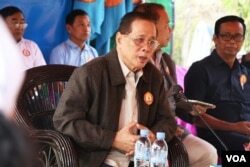 Even Sok Saroeun, 73, who considers himself a staunch supporter of Prime Minister Hun Sen’s Cambodian People’s Party, said he felt under pressure. 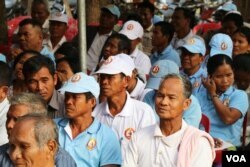 “No one dares to protest against Hun Sen,” he said. “If you dare to protest, you will be destroyed.” He said his commune needed a new road, a water irrigation system, and a better health center. Although he has voted for the CPP for as long as he can remember, he said he felt confused about the upcoming Senate election.